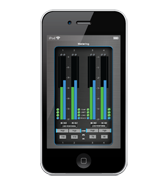 Anaheim, CA--Crown Audio's “Powered By Crown” iPad/iPhone App was designed to provide users with enhanced control and configuration of its amplifiers. The new application can be deployed to control and monitor amplifiers by setting the basic control panels on an amplifier or handle a complete setup through Harman HiQnet System Architect. “Building amplifiers that can operate on an Ethernet network provides us with unlimited expansion opportunities and the addition of an iPad application couples our industry-leading amplifier technology with control and monitoring capabilities that make system control infinitely simpler,” stated Marc Kellom, Director, Marketing for Crown. Inputs, routing, load monitoring, metering, thermal conditions and levels are all controllable through the app. This application will also be compatible with the iPod Touch and is now available on Apple’s iTunes store.